I don't know what it is about beach huts that we find so attractive. They seem to conjure up an almost bygone era when beach holidays were always sunny, when sandcastles always turned out pristine and when children always played together happily in the summer holiday. Whatever it is, a friend send me a postcard from Southwold in Suffolk last Summer, showing a row of brightly coloured beach huts, some of them striped. I absolutely loved the card and had it pinned up in my workroom for weeks until it finally gave me the inspiration to make this wall hanging. Accuracy is not my strong point with patchwork and quilting as I am not the world's best needlewoman - but I do love colour. Most of the cotton material in this wall hanging is from Kaffe Fasset's designs and I absolutely loved working on it. It hangs now on my bedroom wall above the bed. Unfortunately the quilt I had on the bed just did not go with the colours in the wall hanging, so I have had to make a new quilt as well! There is something about material that is exciting in itself before you even start on the project. A friend and I used to regularly take our stash of material out of the cupboard and look through it, just for the sheer pleasure of admiring it. I hope it conjours up beach huts for you too. My week (7) Autumn is here! Yes! It's official! Autumn is here! How do I know? Well, for a start - the swifts have gone. Suddenly one day there are no aerial manouvres above our house. Crafty Green Poet remarks also how early they have gone from her neck of the woods. Are they trying to tell us something? Then there are the swallows. We had about eight nests in our various sheds and barns. Isn't it amazing how they return to the same place each year (and what a joy it is to see them arrive on or about April 21st)? Now there are about a hundred - some flying, swooping, head-hunting the farm cats - some sitting on the wire waiting to be fed - but when we get up in the morning they are all in long rows along the wire. In a short time they will be joined by hundreds of others so that the wires are full. I think we must be a stopping-off-place for swallows coming down from the North. Then there is the heavy dew. We are now able to hay-make as the weather has improved, although at this time of the year and given that the grass is pretty dead and worn out at the roots, it is more likely to be haylage. But we can't start shaking the grass up until nearly lunch time as it is so heavy with dew. And - finally - as you will see from this week's photograph - we have had our chimneys swept. This is an annual event to get our fireplaces ready for Autumn log fires. On the appointed day I take down all pictures and remove all ornaments for washing and in comes Skip, our local chimney sweep. We (the dog and I) watch his every move, rush outside and make a wish when the brush comes out (each time). Then, when he is gone, I wipe, polish, clean the windows (I am ashamed to say I only clean the inside after the sweep has been!) and everywhere is ready for the first fire of Autumn - whenever that should be necessary. Lovely feeling when it is all done - almost worth the hard work!! 1. The winning "from the garden" flower arrangement. It was our local Agricultural Show last Saturday and - praise be - it was a lovely sunny day (after weeks of rain). In the days when farmers had loads of men working their land, when transport tended to be Shanks's Pony and when most people never went further than their county town in their whole lives, these Shows were for many the highlight of their year. It was the time when you met your friends, swopped farming tales, showed off your best stock and the best of your vegetable garden - and the wives baked cakes and arranged flowers and a good time was had by all. I am pleased to say that that kind of event has survived up here. In some ways people see the Show as an anachronism but country people up here take it all very seriously. Competition in the horticultural tent and the cookery tent is fierce. It is good to see the children joining in. The quality of the stock is superb -cattle and sheep and some heavy horses. Being a holiday area we get lots of holiday makers who drop in for a jolly day. All the farmers and their wives go and we meet one another and enjoy a chat and relax. And best of all our Feed Merchant lays on a good supply of splendid beef sandwiches so that we can sit in comfort, eat and drink and watch the procedings. on a cold Winter's morning. 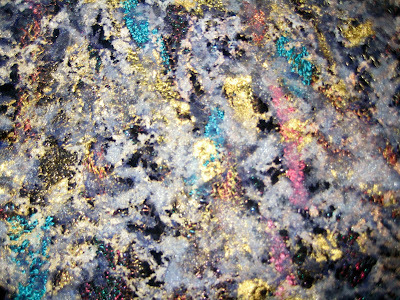 This is a textile piece which I did some time ago. It is an attempt to show the land from the air, seen through thin cloud cover. Travelling by air one so often looks down and sees a patchwork of fields, lakes, villages etc. through patchy cloud. I have tried to convey this. I have layered chiffons, sweet papers, metallic materials and bit and bobs of material, sewn them lightly and then burnt them back, using a heat tool. and the cat sleeps again. In my piece about the journey through Wharfedale to Kettlewell (my week (5) I mentioned the tiny village of Hubberholme, nestling in the valley of Langstrothdale Chase. This week holding the day of our Wedding Anniversary, we returned to Wharfedale and turned off down the leafy lane to Huberholme. The road is narrow and suddenly comes out along the side of the Wharfe - and you are there. A pub, a church, a farm and two or three old stone houses - that's it. The River Wharfe cuts through the village and divides it in two. On the South side is The George - and old coaching inn - and then over the bridge lies the church. It is an unusual shape in that it is wide and somehow squat, so that it appears from some angles to be almost submerged in the greenery. But it is a gem. JB Priestly, the Bradford-born writer, considered this to be the most beautiful place on earth and had his ashes scattered here in what is the most peaceful of churchyards. Parts of the church have Norman origins but in some ways the architecture is quite unimportant. The peace and the isolation make it a very powerful place. It is quite unspoilt. As you sit there you become aware of several interesting things. Run your hand down the side of the pew where you are sitting and you might come across a wooden mouse climbing up towards you, for these pews are the work of "the mouseman", Robert Thompson of Kilburn, and his signature mouse occurs here and there throughout the church. And you cannot fail to notice the highlight of the interior - a sixteenth century rood loft screen with delicate pierced tracery - a real gem and such a surprise in so lonely a setting. This sculpture of the brown hare was made by Stef Ottevanger of Reeth in North Yorkshire. When I bought it she told me that she had been out walking early one Sunday morning when she had seen the hare. She quickly sketched it, went home and created this sculpture. I feel she has captured "hareness" quite remarkably. So many pictures, drawings or sculptures of the hare somehow miss the essence of the animal. SPAINING This has been the week for spaining (another dialect word) - separating the lambs from their mothers. I guess the mothers are pleased to see the back of their boisterous teenagers but that doesn't stop them making a lot of noise when they are separated! Our Swaledale sheep are taken away by their owner for spaining and then taken back on to "the tops" where they spend most of their lives. They come here again in the Winter, when the weather on The Buttertubs is too severe. WHARFEDALE We have been, as usual, to Kettlewell Scarecrow Festival. An old lead mining village in the heart of Wharfedale, Kettlewell has staged this festival for some years now and it really draws the crowds. For me the journey there is as exciting as the scarecrows themselves because, although only twenty miles away, the scenery is marvellous. We drove through Lower Wensleydale between fields of sheep and cattle, with Penhill on our left - at1727feet it is our landmark round here and serves as a beacon site for special events as it has done through the ages. Then we turn South into Bishopdale - a richly agricultural dale with water meadows on the right (full of sheep and cattle) and steeply rising fields on the left. Suddenly the road narrows and begins to climb - here the roadsides are thick with Giant Bellflower and I look forward to seeing them every year. Then we are at the top of Kidstones Pass (1392feet). We need to stop here to catch our breath before the descent so we have time to look at the old Roman road leading off over the hills. Then we go down - between two waterfalls - through the tiny village of Cray and into Buckden. As we drive down, Langstrothdale comes in from the East, bringing with it the young River Wharfe, and the whole of Wharfedale opens up in front of us The tiny village of Hubberholme with its beautiful church nestles in a valley to the right (more of that another time). In no time at all we are in Kettlewell. The scarecrows have had a real soaking this year, but it doesn't deter the villagers and it doesn't stop the crowds. Visitors fill the narrow roads. Scarecrows sit in trees, hang from windows, climb ladders, paint houses.. There is the usual bridal group outside the church. Everywhere is bustling. The pub is doing a barbecue, the shop is selling mini scarecrows, the Post Office is selling ice cream, the Village Hall is doing teas. We walk round in the warm, damp weather and look for our favourite. It is the cricket match. I photograph it from the road above the cricket field (the nearest you can get to it). From that distance it is easy to think it is a real match until you realise nobody is moving! What do you think? Labels: Yorkshire Dales. Dialect. Countryside.. 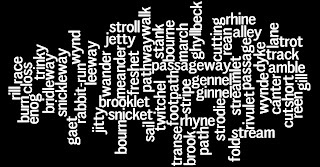 Thanks to everyone who contributed to the dialect words for paths and streams. I have put them all onto a wordle here. I am sure there are at least as many again. Because both paths and streams were thoroughfares in days gone by (streams taking the lowest point in their course were sure ways of having an easy walk if there was no footpath) they would be important talking points. Just as we tend to talk about our motorway journeys travellers would talk about their walking journeys too. What a pity it would be if these dialect words died out; they are so colourful. foreign among the limestone rocks. What kind of man left it here? What thought could we have in common? drawing in its heady scent? and the deer as food for his belly? Was his village here? Where I am standing? the woman who bore his children? and wait for his return? And why did he leave the axe here? lived five thousand years ago. No haymaking in this changeable weather so plenty of time to work on the garden. Farmers are supposed to be poor gardeners, but this farmer is the exception. There is plenty of colour provided by Lucifer, Patricia and Doris - not people but Crocosmia, Herbaceous Geranium and Dianthus! The three make a startling explosive clash of colours. Another highlight of the week has been the journey from Leyburn to Sedbergh (A684). This scenic road cuts straight through Wensleydale - fells to either side, small, stone villages, even the infant River Ure for a short way - goes over the spine of The Pennines and down the other side. Swaledale sheep are a hazard as they wander freely on some stretches but I make the journey regularly and know where to look out for them. It never fails to thrill. The little market town of Hawes marks the halfway point and is always bustling with activity Winter and Su mmer. As I went over the highest point it struck me what a short Summer it is up there. Autumn comes early in the hills. when the season seems to stand still. yellow ragwort and a few spires of rosebay willowherb. and turned the same dark, dying green. On The Howgills, the clouds flirt with the tops. And a faint mist marks out the beck's course. There are four old stone barns on our farm. Each stands at the edge of a field, its door facing into the field, its back to a hedgerow. There were once five barns but in the twentiethcentury one was demolished to provide stone for a new milking parlour. The field where that barn stood is still called Cow House Field, although barely any trace of the barn remains. In earlier times barns were an essential part of the farm. In Winter cows were housed in them - six to a barn. Each day they would be let out to drink in the beck. While they were out the farmer would clean out the barn with a shovel, throwing the "muck" into a "midden" through a square hole in the wall. Then he would put down fresh straw on the floor and fill the wooden rack with hay. He would also visit twice a day with his pail and stool to milk the cows. Now these barns stand empty. Some of the larger ones, near to services, have been converted into houses. But many of them are too small and too far away from electric supply to make any kind of conversion viable. But look inside one and you get a taste of the past. The cobbled floors are often still there - cobbles dislodged by a family of rabbits who have taken over the des. res. The wooden stalls are there, bleached white with age and eaten away in places by woodworm. The hay racks stand empty and behind them is the passage where the farmer stood to put in the hay. Here and there a roof tiles is slipping; sometimes an ash sapling is growing through the roof; sometimes some of the good stone roof tiles have been removed for use on another building. But mostly these barns are falling into disrepair and will eventually end up as a pile of stones in the corner of a field to be used for some repair job or other. In the meantime they are left to nesting stock doves and jackdaws, who fly in and out through the square hole used for mucking out in the old days. They lay their eggs and raise their young on the shelf beneath the eaves. My main reason for starting a blog was so that I could publish my poetry. The trouble with writing poetry is that you read it to a few friends and relations and then put it in a file, where it moulders away and is never read again. I don't want that to happen. So please read it - preferably aloud. Even though I shall not be able to hear you I shall know that my poems have gone out into a wider world than my sitting room. A sure sign that haymaking is over - my hens find a freshly mown field and are in it like a shot - plenty of creepy crawlies to find - they are in their element. Only phase one of haymaking is over as the weather has turned very wet. Yesterday we had over one inch of rain in eight hours, so the ground is far too wet to continue and it will be several days before the grass is dry enough. It makes the phrase "All is safely gathered in" very real. These days with machinery we can gather the crops in quickly. In the old days, when they relied on man (and horse) power it took much longer and farmers, who relied on hay to feed their stock in winter, must have had sleepless nights over getting their hay into a stack and getting it thatched. Tess our Border Terrier claimed one rack of hay bales as her own. She thinks haymaking is great fun!